To support community and technical college faculty in their efforts to enhance employability skills instruction, the NSN Network aims to aggregate and share quality, no-cost teaching resources. The initial collection highlighted on this page represents resources developed by NSF-ATE projects as well as state and federally-funded education and workforce development projects. Over time, the Network’s goal is to share promising instructional materials, assessment tools, and teaching strategies from a broad range of institutions and disciplines. While our primary focus is to support STEM-related associate degree programs, faculty and employers from all disciplines are encouraged to use and contribute to this resource collection. Details on sharing resources with the Network are provided below. Complete our Resource Exchange form to get started. The Necessary Skills Now project paired faculty members with employers to develop scenario-focused project-based learning modules embedding employability concepts into existing courses in cybersecurity and advanced manufacturing. Five modules are available for each discipline. Developed for the North Carolina Community College System, this eight-module toolkit is designed to support instruction for high-demand employability skills. Each module contains instructional materials including activities, student handouts, assessment rubrics, and annotated presentation slides. 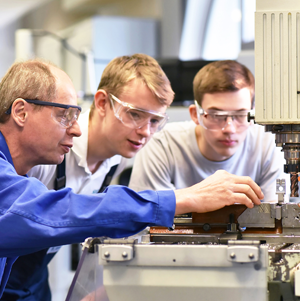 Developed by the Minnesota State Advanced Manufacturing Center of Excellence, these 26 Career Success Skills learning modules introduce important workplace skills to help current and future employees succeed in their careers. Each module includes an instructor’s guide, PowerPoint with embedded video, audio, and quizzes, and a student workbook. Developed by the California Community College system, this series of lessons and videos helps instructors teach “Top 10” 21st Century employability skills, as identified by industry skills panels. The College & Career Readiness & Success Center developed Integrating Employability Skills: A Framework for All Educators to support regional and state education agency staff in building their knowledge and capacity to integrate and prioritize employability skills instruction. Based on ED-OCTAE’s Employability Skills Framework, the module contains a facilitator’s guide, slides, handouts, and a workbook for individuals or groups. This framework was designed to define and clarify essential employability skills and provide a standard for the state of Illinois. The framework was developed through the collaboration of the Illinois Community College Board, the IL Dept. of Commerce and Economic Opportunity, Illinois businesses, local chambers of commerce, and secondary and postsecondary educators.